The progression of military tactics and weapons has made the freedom of movement offered by lightweight armor a desirable feature. 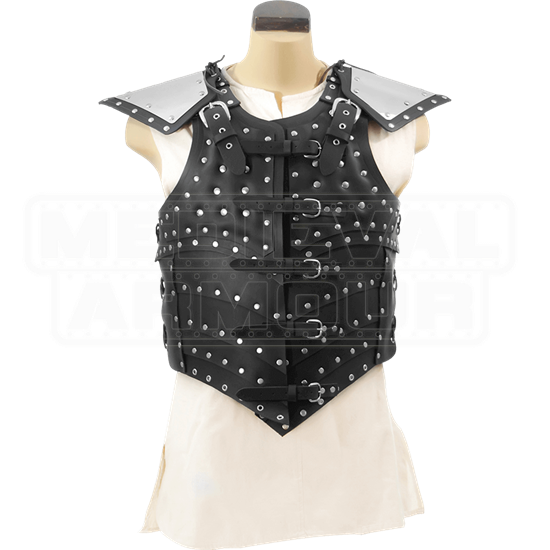 The War Vest with Pauldrons provides protective coverage while allowing comfortable motion. Nickel-plated rivets stud this vest, adding fantastic style to the functionality of this piece. Made from 9-10 oz. leather and 20 gauge stainless steel, this armor has good weight and strength, possessing the durability necessary to be used as costume armor or LARP gear. The steel-plated pauldrons can be removed if desired. The War Vest with Pauldrons suits many kinds of characters, including musketeers, bards, and thieves! Great for use in LARP events, Renaissance fairs, theatrical productions, and more!